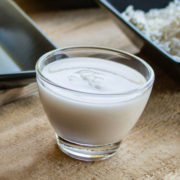 When koji is mixed with salt and steamed rice, then allowed to ferment in a warm environment, the rice grains break down into enzymes, glutamates, and sugars, imparting a mild salty taste with great umami (fifth taste) flavors. Shio koji has the appearance of a thick and lumpy white paste and looks similar to rice porridge. Use it in dressings, dips, brine, marinades, sauces, and soups. It will enhance the flavour of your food, tenderize your meats, and is good for you. This versatile seasoning does so much more than the salty taste out of the container. The live cultures within the seasoning activate the ingredients you put them on. There is such a variety of tasty applications that Shio-koji will become your favorite pantry ingredient. Benefits of Shio-Koji: First, it is very tasty. It is a natural pro-biotic seasoning. Brings the same saltiness with Half the sodium. Contains minerals, fiber and vitamins. Aids in digestion and good for general health. Renewal in Japan – Shio-koji was lost to the Japanese culture for almost a century. It was once a common pantry item and used in every day cooking. It disappeared from the pantry shelf in the early parts of the 20th centre, around the same time that MSG was making a rise … coincidence?…. We are all fortunate that a 300 year old miso family business looked into old family recipes and came across shio-koji’s use. The owner re-introduced it to Japan in 2007. Today, once again, Shio-koji is a common every day item in Japan cooking. Chef’s and foodies around the world are discovering this wonderful ingredient. 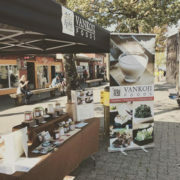 It has been Vankoji’s mission to make this available to you in Western Canada.